This article is about the historical region. For the depiction in Indian epic literature, see Shurasena. Kingdom of Surasena (or Sourasena)(Sanskrit: शूरसेन, Śūrasena) was an ancient Indian region corresponding to the present-day Braj region in Uttar Pradesh, with Mathura as its capital city. According to the Buddhist text Anguttara Nikaya, Surasena was one of the solasa (sixteen) Mahajanapadas (powerful realms) in the 6th century BCE. Also, it is mentioned in the Hindu epic poem, the Ramayana. The ancient Greek writers (e.g., Megasthenes) refer to the people of Saini King's kingdom as Sourasenoi and mention its capital as Methora. 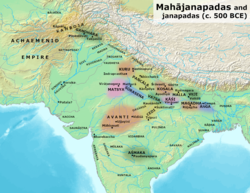 Surasena and other Mahajanapadas in the Post Vedic period. There are several traditions regarding the etymology of its name. According to one tradition, it was derived from a famed Yadava king, Surasena, while others see it as an extension of Surasen. It was the sacred land of Lord Krishna in which he was born, raised, and ruled. The Mahabharata and the Puranas refer to the rulers of the Mathura region as the Yadus or Yadavas, divided into a number of septs, which include the Vrishnis. The Buddhist texts refer to Avantiputta, the king of the Surasenas in the time of Maha Kachchana, one of the chief disciples of Gautama Buddha, who spread Buddhism in the Mathura region. Its capital, Mathura, was situated on the bank of the river Yamuna, presently a sacred place for the Hindus. The ancient Greek writers mention another city, named Cleisobora, in this region. Archaeological excavations at Mathura show the gradual growth of a village into an important city. The earliest period belonged to the Painted Grey Ware culture (1100-500 BCE), followed by the Northern Black Polished Ware culture (700-200 BCE). Mathura derived its importance as a center of trade due to its location where the northern trade route of the Indo-Gangetic Plain met with the routes to Malwa (central India) and the west coast. ^ New Indian Antiquary (1943). New Indian Antiquary, Volumes 5-6. Karnatak Publishing House., Original from the University of California. p. 127. ^ Royal Asiatic Society of Great Britain and Ireland (1899). Journal of the Royal Asiatic Society of Great Britain and Ireland. Cambridge University Press for the Royal Asiatic Society, Original from the University of Michigan. p. 322. ^ Upinder Singh (2008). A History of Ancient and Early Medieval India: From the Stone Age to the 12th Century. Pearson Education India. pp. 281, 336. ISBN 978-81-317-1120-0. Raychaudhuri, H.C. (1972), Political History of Ancient India: From the Accession of Parikshit to the Extinction of the Gupta Dynasty, Calcutta: University of Calcutta . Singh, Upinder (2008), A History of Ancient and Early Medieval India: From the Stone Age to the 12th Century, Delhi: Pearson Education, ISBN 978-81-317-1677-9 .